Today morning I went to Office. Had a lovely day in Office. In the evening I went to meet a friend at Park Street. We met in front of Au Bon Pain and then I took her to St. Xavier's College to enquire about the passes for the upcoming Farhan Akhtar concert at 'Beyond Barriers' on 29th January. Me and my friend, we walked throughout the length and breadth of our huge playground. I told her about my bohemian Xaverian years. I really love St. Xavier's College the most. Whenever I am inside the campus, I automatically feel very happy. This place gives me nirvanic happiness and all my troubles and problems vanish instantly. I love St. Xavier's College more than all the women whom I have ever loved in my life. From Xavier's we went to Dreamland Restaurant to have dinner. We ordered mixed gravy noodles and Thums-Up. The food was good. After dinner she went back home. I went to Some Place Else to watch the performance of D-Trio. 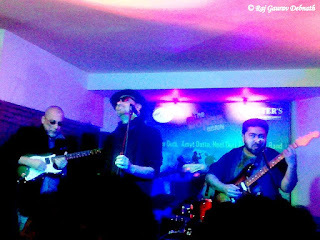 D-Trio consists of Anjan Dutta, Amyt Dutta and Neel Dutta. I am a huge fan of Anjan Dutta. In the nineties I used to buy all his audio cassettes from Rashbehari Melody. I used to listen to them day in and day out. In 2002 my first girlfriend had given me the album 'Rong Pencil'. I was supposed to listen to it and then give it back to her. But unfortunately we broke up the next year and the audio cassette stayed back with me. I still have that album with me even to this day. Two years back I also bought Anjan Dutta's last album 'Unoshaat'. Its a fascinating album. Anjan Dutta is again back in the world of theatre. In 2012 he staged 'Galileo'. In 2014 he staged 'Abani Opera'. In 2015 he staged 'Teen Penny Opera'. In 2016 he staged 'Medha'. He staged all these plays at Gyan Manch. I went to see them all. I really love Anjan Dutta in all his avatars. D-Trio's performance ended around midnight. It was an awesome performance. Anjan Dutta was at his majestic best. This was also like a promotional event for his latest film 'The Bongs Again'. Amyt Dutta, the Guitar-God of Calcutta, simply weaved magic in his guitar strings. D-Trio sang songs like Ranjana, Mary Anne, Samson, Kolkata Sholo, 2441139 etc. It was so nice to listen to these songs even after so many years. Listening to these songs and singing along, my eyes were getting filled with nostalgic tears and there was a lump in my throat. I was remembering the nineties. I was remembering my childhood and my teenage-hood years. I felt like going back to the nineties again. After D-Trio's performance, another band named Rig-Mob started performing. They also performed really well. The female lead singer sang beautifully. They sang mostly English covers. She ended their performance with Shakira's 'Waka Waka'. We all danced to Rig-Mob's songs.